I think it’s safe to say that all of this started with my three New Year’s Resolutions. I wanted to be healthier, do even better financially and be even more green (eco-friendly)! Let’s start with Be Healthier! 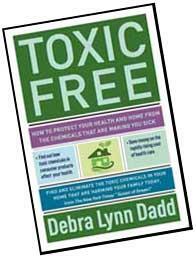 Little did I know that in January I would stumble across a book called Toxic Free by Debra Lynn Dadd which very thoroughly exposes chemicals residing in our homes and products that we use every day. I was not completely ignorant of this because my mother was always very careful about chemicals she used in our home while I was growing up. These include Bleach, Tilex, Pest Control Sprays, etc. because that’s what they are- chemicals! I was also not as aware as I should have been of the chemicals in items like shampoo and deodorant. I have never used many in my home either but now I am especially conscious of it. The other part of Being Healthier that I am trying to follow is eating healthier. Both reducing the chemicals in my house and eating healthier lead me to wanting to use more organic products when I am able to. My next New Year’s Resolutions was to do even better financially. The question then becomes- How do I start replacing chemicals and foods in my house for more Organic, Healthier, Greener options and at the same time not spend a ton of money? I have decided that I am not going to go through the house and throw away all of our cleaning products and stockpile that I may no longer want to use in my home. What I am going to do is slowly start replacing products when I find good deals and looking for better options. As I do, I am going to donate or sell the items that I will no longer be using. – I realized that every woman’s deodorant in my house contains Aluminum. So I am now using baking soda instead. You simply apply a small amount when you are damp from the shower and it disappears just like deodorant would. So far it has worked great! – I started a compost to create soil. I am planning to start planting in a couple months when the weather gets warmer. Hopefully this will save money on fruits and veggies that won’t be grown with pesticides. 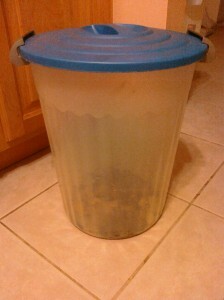 My mother actually offered me this small plastic bin when I was looking for something to put my compost in so I didn’t have to pay for that either. – I bought some Tom’s of Maine products that were a great deal at CVS this week. I was able to use gift cards so it was zero out of pocket. Click HERE to see that post. – I was out of Tilex and instead of going out and buying more I created my own cleaner from equal parts baking soda and vinegar to green clean my shower. We have been very sick in my household for about a month which means that there was some mold and mildew growing that with some light scrubbing my homemade, green cleaner took care of. Click HERE for more green cleaner ideas. Most homemade cleaners are green and I was excited that many could be made from items I already had in my house for FREE and don’t have to cost a lot of money. – I received a cast iron skillet for Christmas from my brother that I was excited about because now I have an alternative to Teflon. My boyfriend’s mother also recently gave me a stoneware cooking item that is also much healthier to use. All of this being said, I am going to start doing more blog posts in two new categories. Natural/Organic Deals and Healthy Food Deals. So check back to see what I come up with!